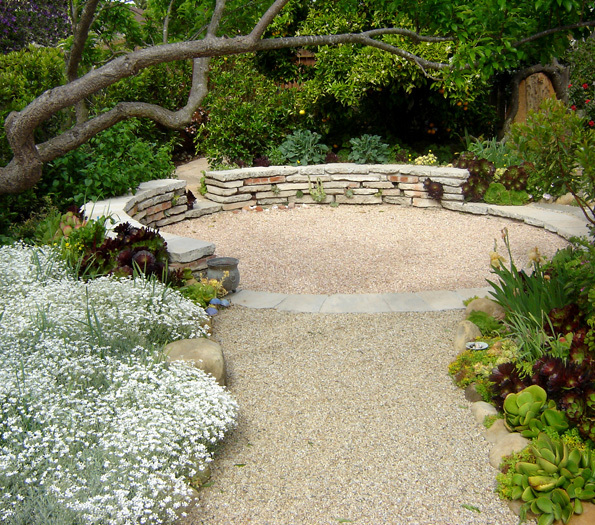 Our client wanted a garden to evoke memories of his Pasadena childhood home and be sustainable in every way possible. 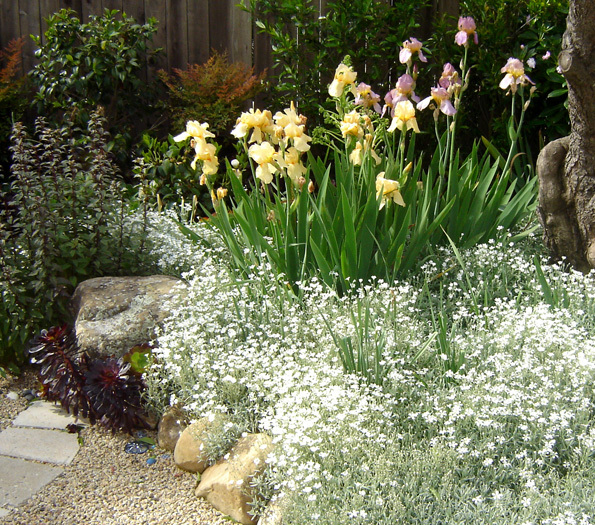 The plantings in this garden satisfy 3 criteria: (1) plants traditionally used prior to introduction of irrigation (pre-1945) – once established don’t need much watering, (2) food-scaping for people and wildlife, (3) Mediterranean plants, native plants, and succulents to completely replace the thirsty, polluting lawn. 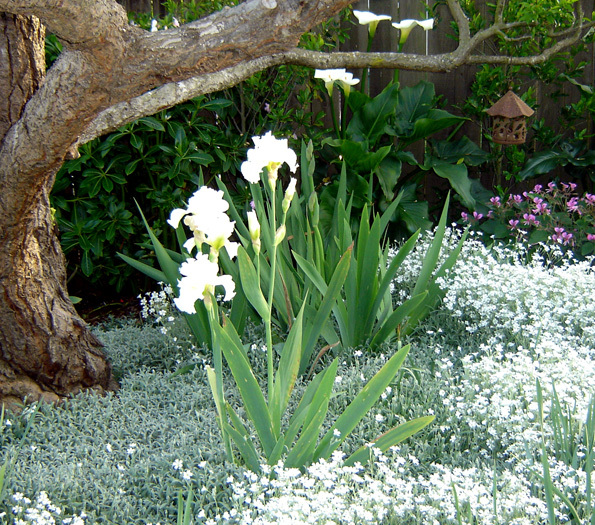 Everything we designed into the garden had to somehow be functional beyond the decorative aesthetic. Overall, there is a hierarchy of movement, like a musical arrangement with crescendos and a series of climatic reveals that leads one to believe the space is actually much bigger than it is, while the modern formality of the hardscape is punctuated and softened by notes of whimsy. 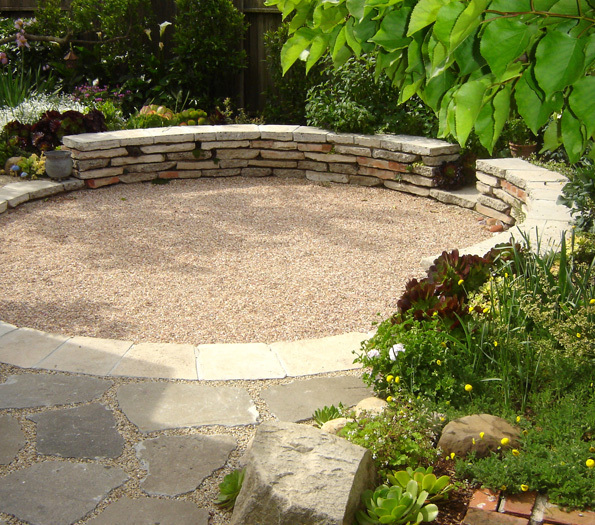 In this garden, there are subtle, powerful design moves that dictate viewing and circulation. The flow comes to rest in the large step down, circular seating area, where the mountain views invite the mind to day dream among the clouds. The narrow pathway and entrance to the garden opens up to a series of clearly defined outdoor rooms in such a way that they expand the square footage of the home, creating a comfortable extension of interior space spilling out into the garden. The various focals throughout progressively lead explorers through the space where enchanting reveals and surprising treasures are discovered along the way. Focals are playful and unexpected; such as a hobbit door that offers support to a distinctly shaped nectarine tree and a spinning seat rock that defies gravity and offers a 360 degree view of the garden and mountains beyond. 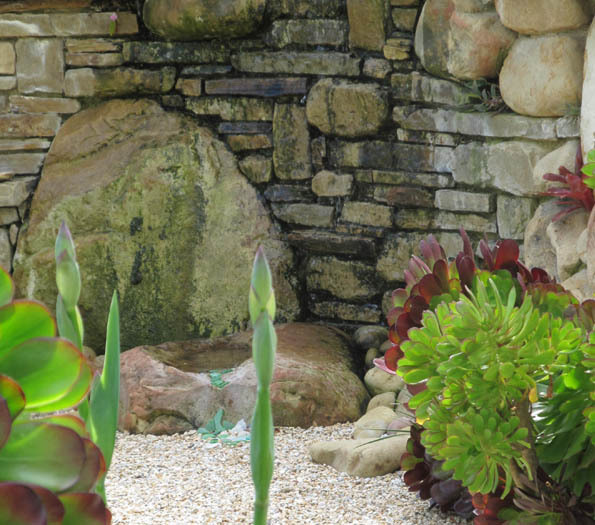 We designed and installed a weeping water wall where the water gently trickles, dances and splashes, from a height of 7 feet, feeding several water basins that provide song birds with fresh water to bathe and drink. This commanding water feature provides pleasing sounds as well as an important and much needed water source for local wildlife and echoes rock formations of the local foothills. 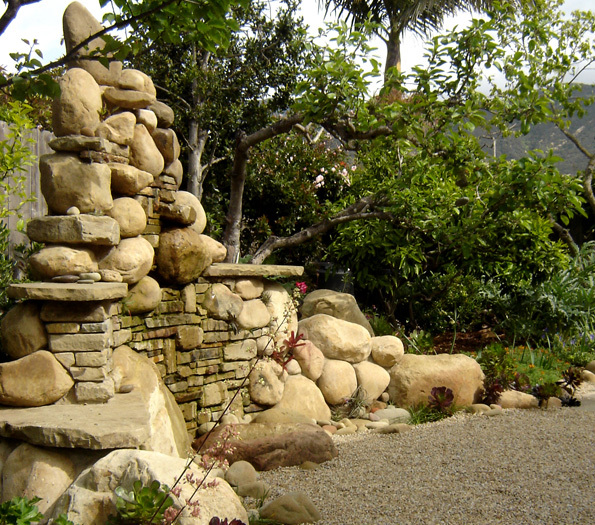 The wall was constructed by a local Santa Barbara artist and master craftsman to look like ruins reminiscent of a once grand estate that must have once graced this parcel, predating the current 1970s home. The thirsty and polluting lawn areas were completely removed. 30 cu yards of rich topsoil was removed to accommodate better drainage (the area was once an alluvial flood plain). This precious and rich resource was posted on Craig’s List, saving it from landfill while avoiding the costs of removal and dumping. It was put to good use in new raised vegetable beds. The many and various fruit trees provide food and dynamic and changing beauty throughout the seasons as well as protective, cooling shade in summer months. The legacy paddle cactus grove was also posted on Craig’s List. The lucky recipient was glad to dig them up and haul them away himself. Again, saving these beautiful plants from an untimely death, and at no cost to our client for their removal. Among the many trees are also many fruit bearing: plum, nectarine, two cherry varieties, Mission & Genoa figs, 4 different apple varieties grafted onto 1 tree (we planted 2 of these, because it was more fun to have eight varieties instead of just 4), one Anna apple, Satsuma mandarin, lemon, orange, apricot, fuyu & Haychiya Persimmons, and pomegranate, along with 3 different blueberries varieties, and seasonal vegetables planted throughout that are blended into the landscape. 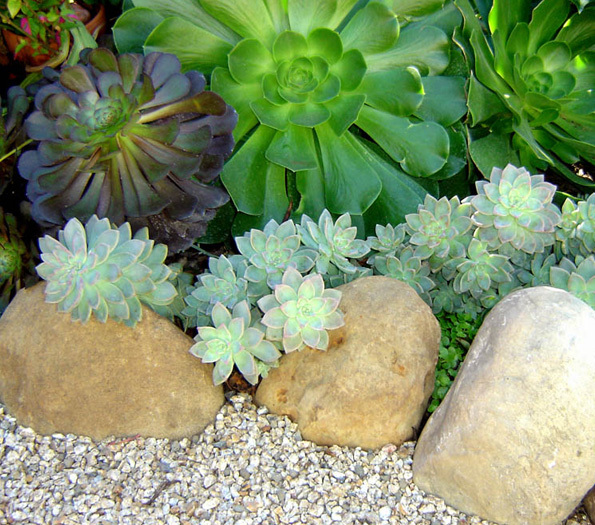 Part of the design includes a lush succulent themed garden that depends solely upon rain fall for its water needs. Replacing the driveway with permeable hardscape paving allows for rain to penetrate and recharge groundwater and feed the new plantings.